The links provided above are intended as a public service. The Transparency Policy Project does not assume responsibility for the accuracy, completeness, or usefulness of any information on any sites other than our own, nor does it necessarily endorse the opinions found on sites to which we have supplied a link. Occasionally links become outdated. If you find that a link is no longer functional, please help us by emailing our webmaster. Under the Safe Drinking Water Act of 1974, the federal EPA set maximum safe contaminant levels for drinking water and required water systems to notify customers of violations. However, in practice such notification often did not take place. Public attention focused on the health risks associated with contaminated water in 1993 after the largest outbreak of waterborne disease on record in the United States. In Milwaukee, Wisconsin four hundred thousand people became sick, forty-four hundred were hospitalized, and more than fifty died from drinking water contaminated with a microbe called cryptosporidium. In response, Congress in 1996 amended the federal Safe Drinking Water Act to require that water suppliers, starting in October 1999, provide customers with annual reports on contamination. The annual reports included information on the source of tap water, contaminants found in the water, sources of contamination, and violations of EPA maximum contaminant levels. Their purpose was to allow consumers to make better choices concerning their use of tap water and to encourage water utilities to be more vigilant in minimizing contaminants. The Milwaukee incident was not the only driver of greater transparency. Americans were losing confidence in their public water supplies. Surveys in the late 1990s found that only three-quarters of Americans regularly drank tap water, and 65 percent increasingly used bottled water or filtered water at the tap. Experts suggested that drinking water contaminants were responsible for as many as one-third of nine hundred thousand “stomach flu” illnesses each year. Contamination levels varied widely with seasons, rainfall, and waste discharges. Sometimes chemicals and microbes entered systems as water flowed to homes through century old pipes. The EPA stated in 2004 that 27 of the 834 water systems serving more than fifty thousand people had exceeded federal safety standards for lead at least once since 2000, which even in small amounts can cause neurological problems in children and high blood pressure in adults. The water system serving the nation’s capital had failed to comply with sampling requirements and had failed to report to consumers that more than 10 percent of tap water samples since 2000 exceeded federal lead levels. Transparency requirements proved too weak to help residents assess risks or compare the safety of different water systems, however. They did not require consistent protocols, units of measurement, or formats for reporting contaminants. 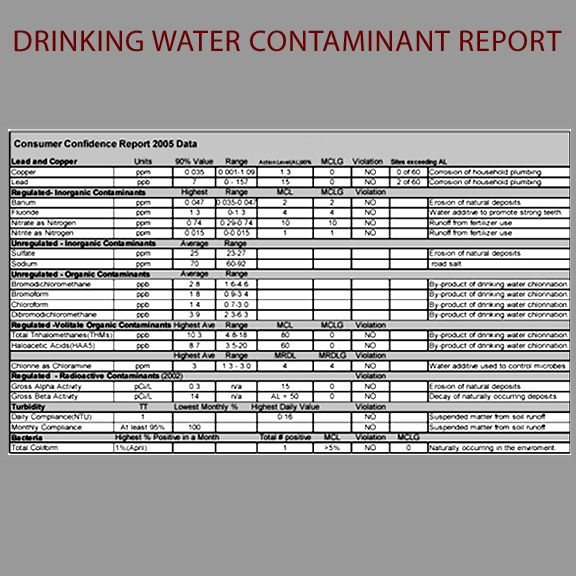 In 2003, an analysis of drinking water reports in nineteen cities by the National Resources Defense Council found that some cities buried or omitted information about health effects of contamination or warnings to consumers with compromised immune systems, all omitted information about specific polluters, fewer than half offered reports in languages other than English, and many made sweeping and inaccurate claims about water safety despite violations of federal contaminant levels. As of 2006, the drinking water contaminant disclosure system appeared to be unsustainable. Reports had improved little over the years in scope, quality, or use. Interestingly, new emphasis on homeland security raised the possibility of requiring more timely monitoring (and perhaps disclosure). In 2004, experts convened by the federal Government Accountability Office ranked “near real-time monitoring technologies” to detect contaminants as the highest priority in improving drinking water security. Two years earlier, the National Academy of Sciences rated improved monitoring technologies as one of four top security priorities for drinking water supplies. After pressure from water utilities demanding clarifications on the electronic delivery of water quality information to consumers, the EPA issued a 2013 memorandum determining that electronic delivery was suitable, provided that the links were direct and did not require lengthy navigation. Evidence of the effectiveness of this reporting system is mixed. A 2008 study of Massachusetts's water system by Bennear and Olmstead found that total contaminant violations went down and severe health violations decreased 40-57% in response to the reporting requirements. But a 2011 GAO report is less optimistic. The report found serious gaps on the water quality data generated by local water utilities and states. The study found that, for a sample of 14 states, 26 percent of health violations and 86 percent of monitoring violations were inaccurately reported or not reported at all, undermining the EPA's ability to enforce safe drinking water regulations. This case study is drawn from Full Disclosure, Fung, Graham and Weil, 2007.